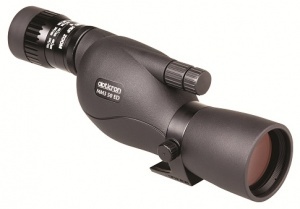 The Opticron MM3 series is the latest evolution of the travelscope concept pioneered by Opticron nearly 20 years ago with the original Mighty Midget 20x50. Constructed from polycarbonate and lightweight alloys, the optical system is compact enough to create a body only 205mm (8”) long. Weighing 600g (21oz) without eyepiece, 690-875g (24.3-31oz) fitted with an HDF or SDL eyepiece, an MM3 50 ED weighs about as much as pair of standard 42mm binoculars and can be used without a support for crystal clear flat field observation at magnification between 12-15x. If like many users your viewing usually requires the stability of tripod or clamp, the models connect via a universal ¼” thread at the base of the tripod sleeve. Fully rain and dust proof and protected against knocks and bumps with full-body rubber covering, the MM3 50 ED is available in straight-through and 45° angled bodies to suit different applications. Compatibility with the full range of HR, HDF and SDL eyepieces also means Opticron fieldscope owners can use their existing eyepieces with a new MM3 50 ED body. The preferred choice for image quality and viewing comfort, the HDF zoom eyepiece has a large diameter eye lense and provides 'walk-in' field of vision. Featuring long eye relief for full field of view with or without spectacles, the eyepiece also has a twist-type eyecup.